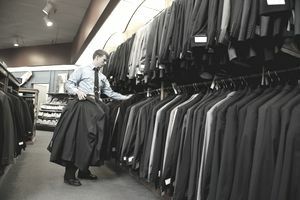 Where Can I Donate Business Suits I Don't Need? What Should I Do With Professional Attire I No Longer Need? Have you decided to revamp your work wardrobe and found that you have some suits and other business clothing you no longer need? Before you start tossing everything in the trash, consider donating new or gently used items to an organization that will give it to people who can't afford to purchase job interview and work attire. People who are in dire financial need find themselves in a terrible predicament. They want to work, but they can't get one because they don't have the money to buy the right clothing to wear to job interviews. In addition to distributing professional clothing to job seekers, these organizations also provide other services including job search assistance. Most also welcome monetary donations. Dress for Success: This national organization distributes women's business suits and other professional clothing to women around the country. Each client receives a suit, shoes, and accessories to wear on job interviews. Those who get hired receive appropriate workplace attire. You can bring unwanted interview-appropriate suits, separates, shoes, accessories, unused undergarments, and unopened cosmetics to a local Dress for Success affiliate. Some also accept coats. See the Dress for Success Website for locations and additional information. Career Gear: This organization, which distributes interview and work-appropriate clothing to men, is based in New York City and has affiliates in Houston; Baltimore; Washington, D.C.; Miami; and Jersey City, New Jersey. You can bring your donations to the New York City office or a local affiliate on specified dates, or ship them. Please visit the Career Gear Website for further information. Alliance of Career Development Nonprofits (ACDN): The ACDN is a network of nonprofit organizations around the United States that provide career development services to women, men, and teens. Many distribute workplace attire to their clients. Search for a member organization by state and contact it directly to find out what items it will accept and how to send your donation. Local Organizations: You can also find local organizations by typing your city or town and "career clothing donation" into your favorite search engine. Also, try contacting local organizations like outreach agencies at houses of worship, food banks, and shelters for the homeless or victims of domestic violence. While the organizations understand not all donated attire will be brand new, it should be no more than gently used. All items should be in excellent condition. They must not be frayed, faded, or stained. Shoes should not be in disrepair. Avoid bringing in items that have odors. Do not donate attire that is grossly out of style. All undergarments, including socks, should be in their original packaging. Check pockets for used handkerchiefs or tissues, as well as other trash. Although you aren't required to do so, it is a nice gesture to launder your donations. If you are in doubt about whether to donate a particular item, ask yourself the following questions about it: Would I feel comfortable wearing it for a job interview? What would I think of a job candidate who came in wearing the item in question?